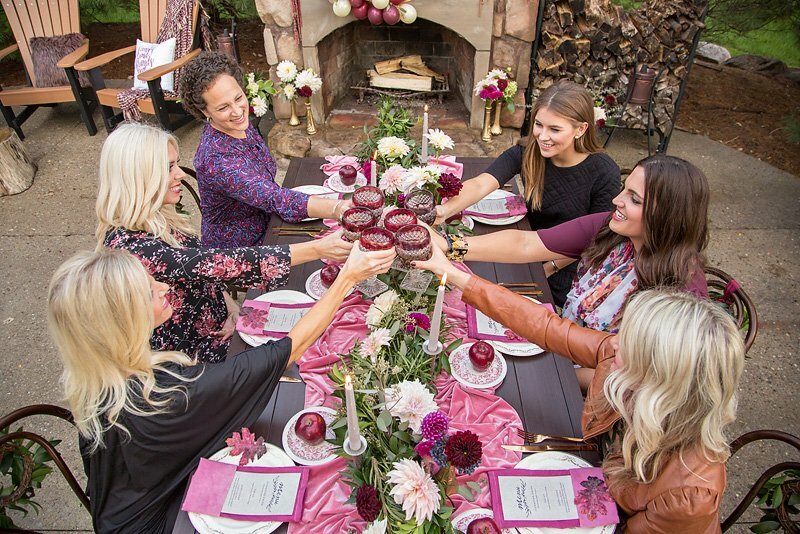 Tara Berger of One Stylish Party recently hosted this dreamy, blush-and-bordeaux Friendsgiving Dinner Party, and it looks like such a fun excuse for a girls night! 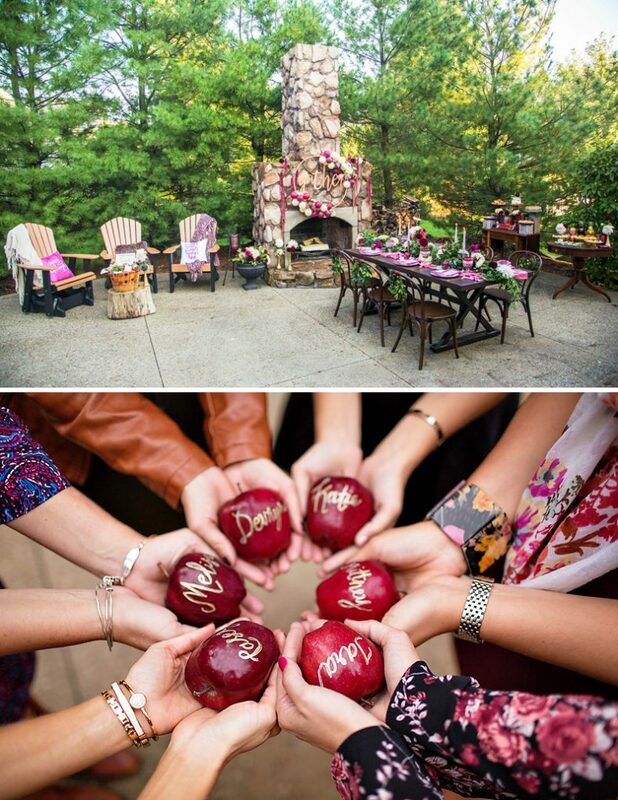 She started with a gorgeous outdoor setting (a.k.a. 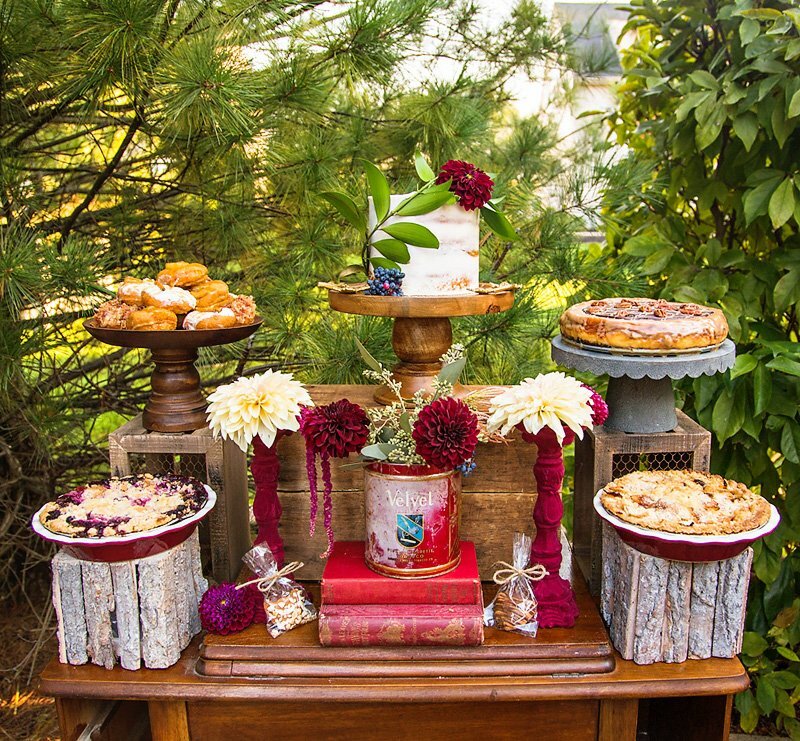 her neighbor’s backyard) and filled it with rustic-glam decor, cozy pillows, chic Thanksgiving inspired appetizers and desserts, and wine-a-plenty. 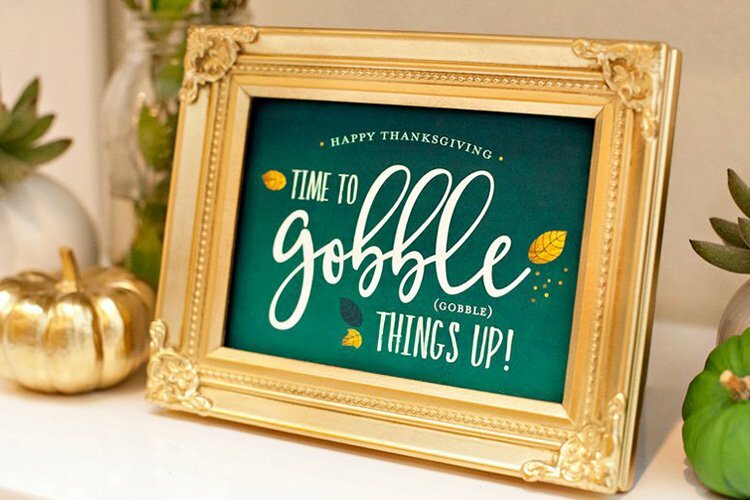 So, in other words, LOTS to be thankful for if you’re a guest at this party, right?! 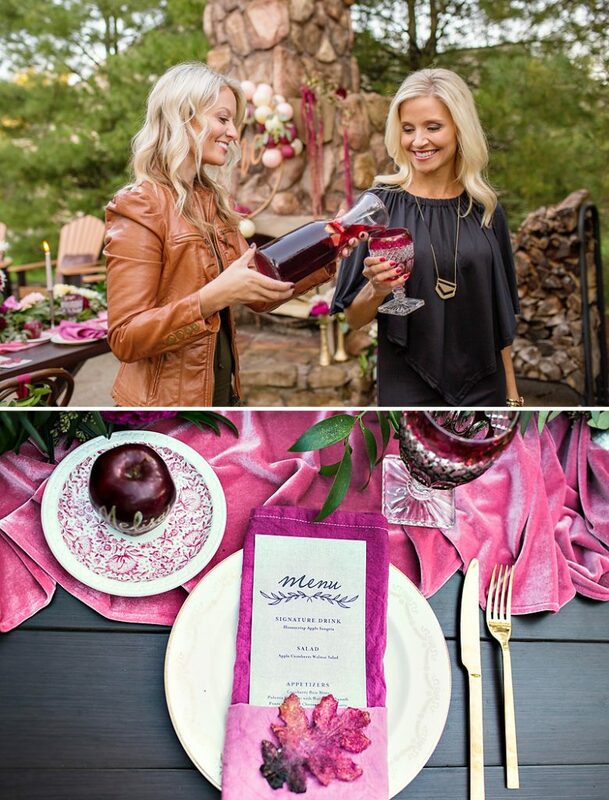 And even though it was designed with girlfriends in mind, many of these ideas would translate beautifully to a family Thanksgiving celebration or wine-inspired bridal shower too. Speaking of getting inspired, don’t miss Tara’s 7 Tips for Hosting a Chic and Cozy Friendsgiving below. They’re super helpful and on point, and I’m especially loving numbers 5 & 6 myself! Friendsgiving is quickly becoming one of my favorite holidays. It is an excuse to gather together with some of your favorite people, similar to Thanksgiving, but without all of the stress! 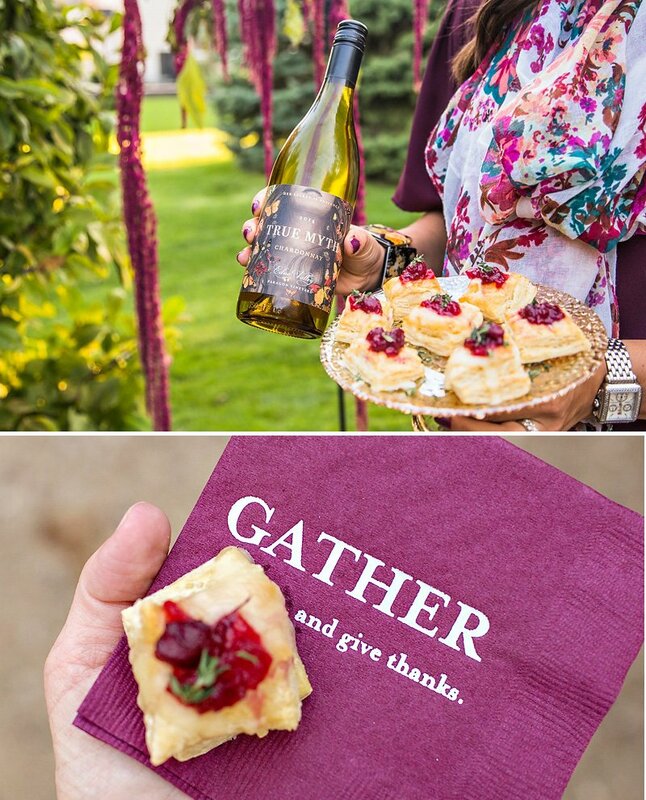 Here are a few tips if you are thinking about hosting a Friendsgiving dinner party this year. 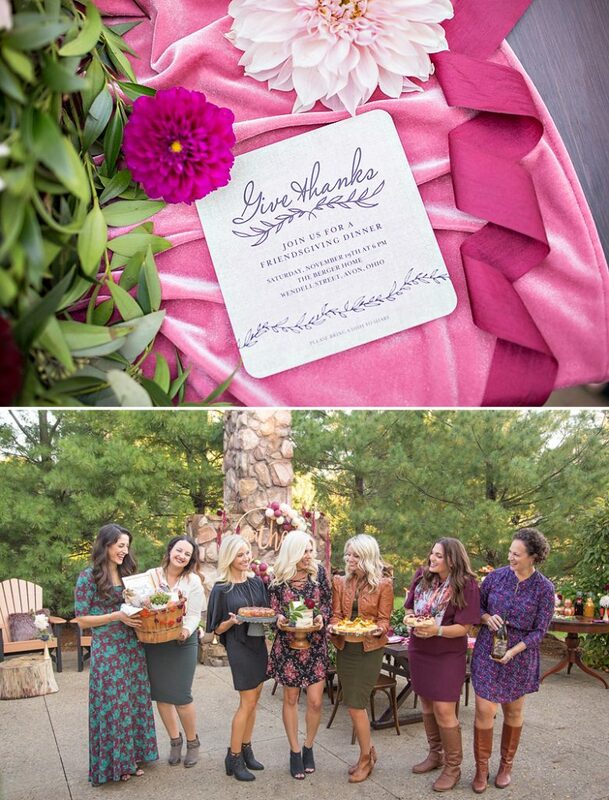 Friendsgiving tends to be a little less formal than Thanksgiving, so feel free to get creative with your location. 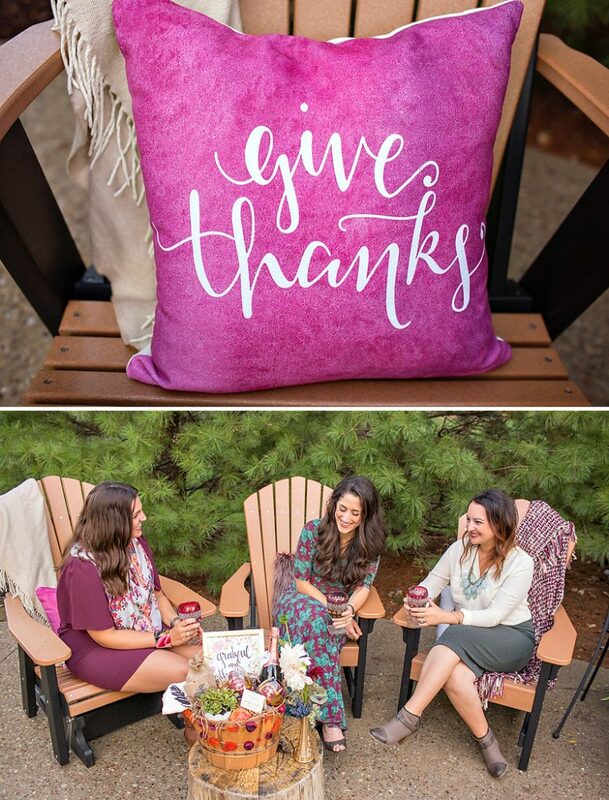 When planning my Friendsgiving, I wanted it to have a feminine, yet cozy vibe to it, so I decided to host the party on my neighbor’s patio. The outdoor space allowed me to setup the tablescape in front of a stone fireplace that provided the perfect amount of warmth on a cool fall evening. 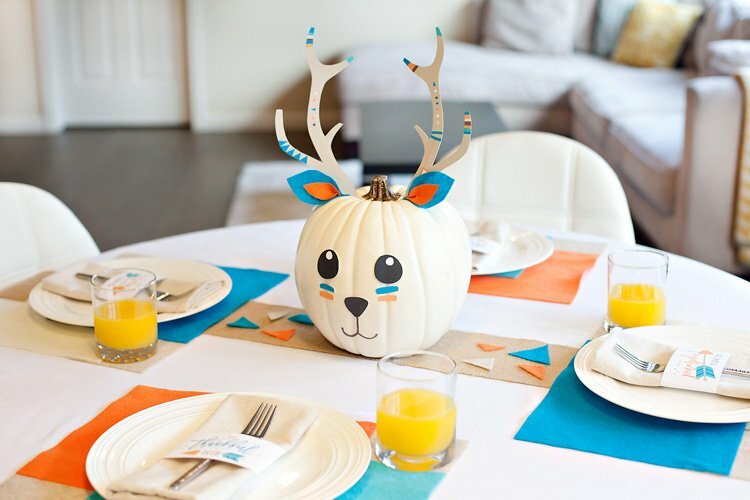 Don’t feel pressured to stick with traditional fall colors or decor. 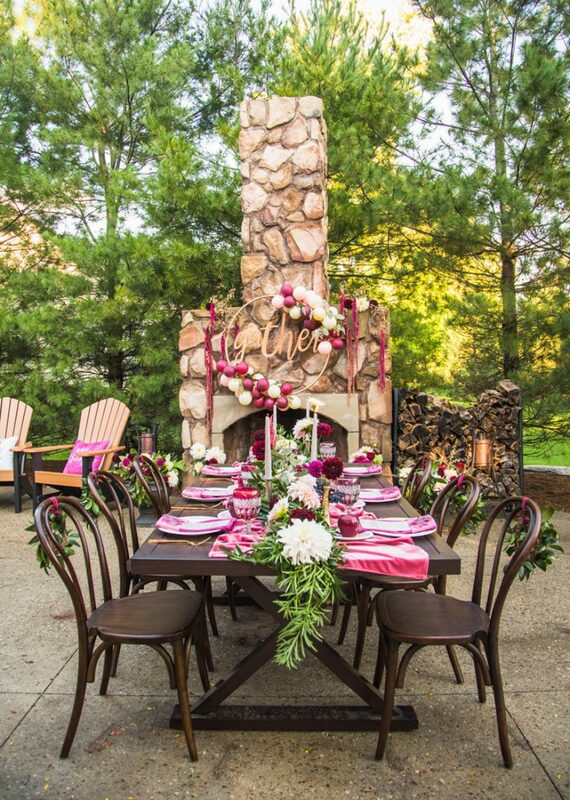 I used an unexpected color pallet of bordeaux and blush tones, which contrasted beautifully with the natural stone and wood elements on the patio. I set the dining table with vintage china and glass goblets paired with hand dyed napkins, custom menus and gold flatware. 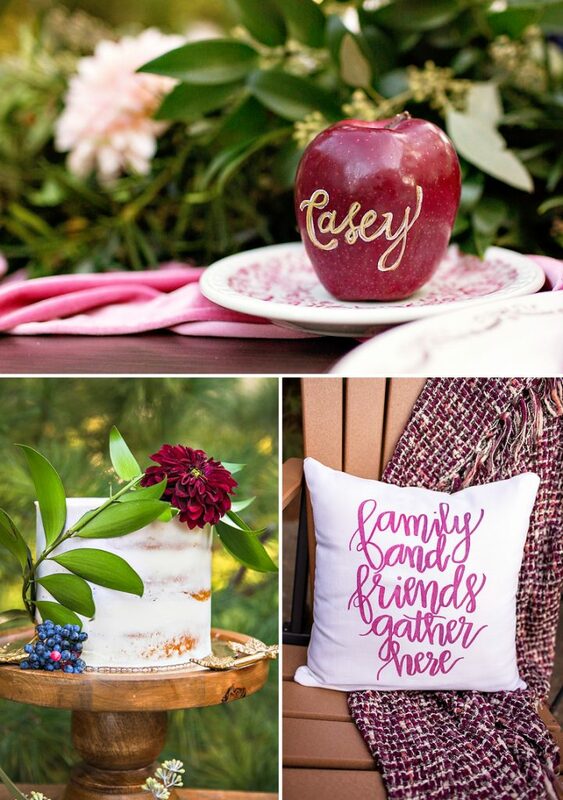 A hand lettered apple served as the placecard for each guest and a rose gold velvet table runner added the perfect pop of color and texture to the table. 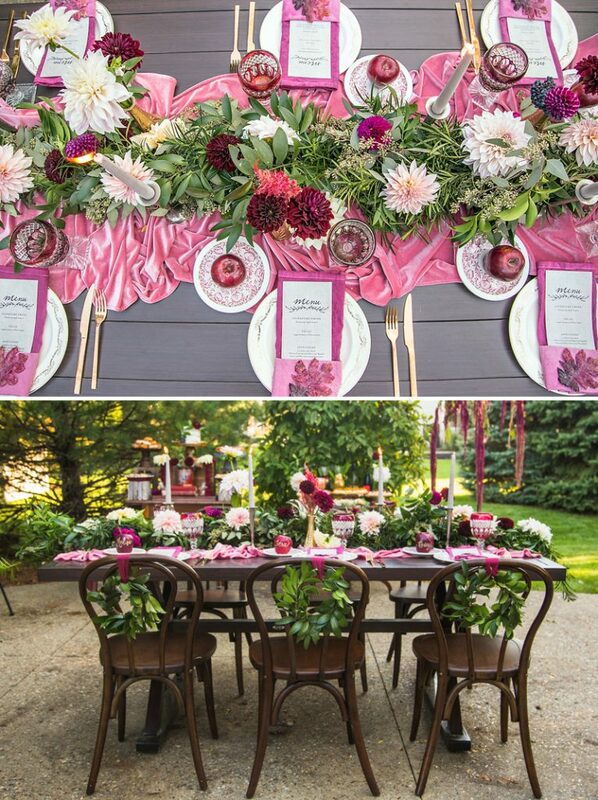 Greenery and flowers can quite literally transform a space and elevate a party to a whole new level. 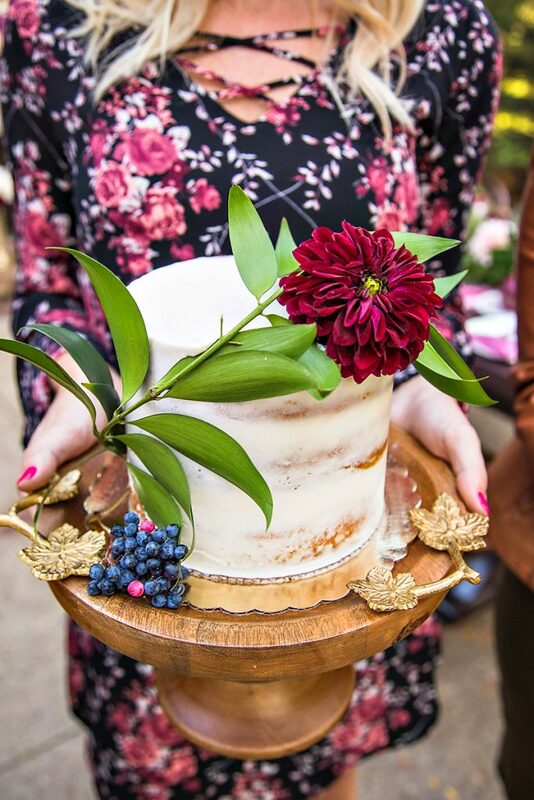 When I hosted my Friendsgiving dinner party, I focused most of the decor on floral elements including a lush greenery garland, deep red and café au latte dahlias placed thoughtfully around the space and amaranthus draped from the fireplace and behind the serving tables..
4. Serve a Signature Drink + Classic Wines. 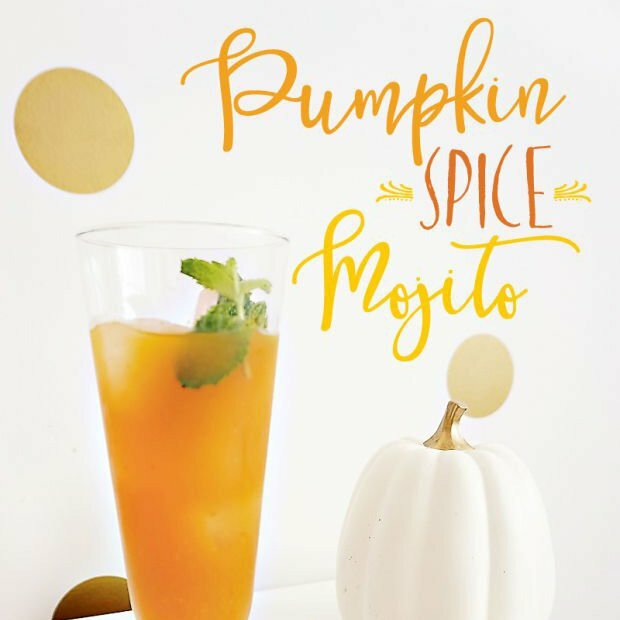 Get creative and whip up a fun seasonal drink, but also make sure you have all of your bases covered. I greeted guests with a honeycrisp apple sangria upon arrival and selected three wines to serve at the party, including a chardonnay, a pinot noir and a sparkling rosé. I also served apple cider for guests who wanted to skip cocktails all together. 5. Create a No-fuss Menu and Delegate the Rest. 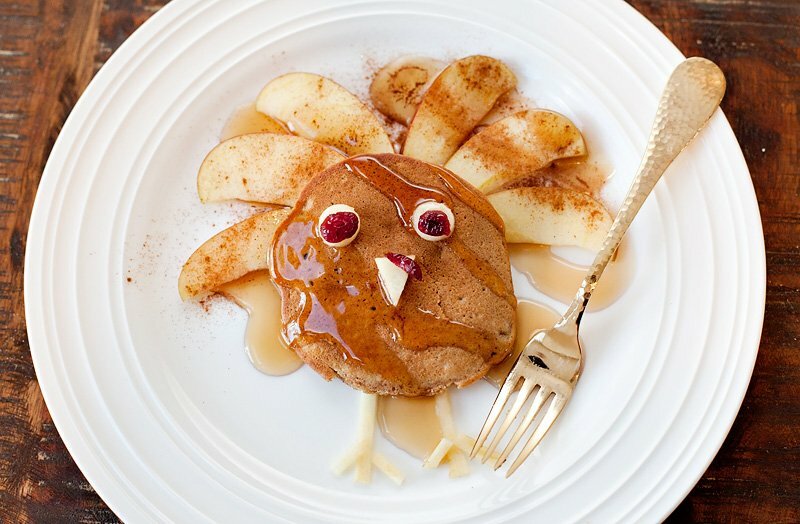 Turkey doesn’t have to be the star of the show at Friendsgiving. I wanted the evening to be less formal, so there was no actual sit-down dinner. 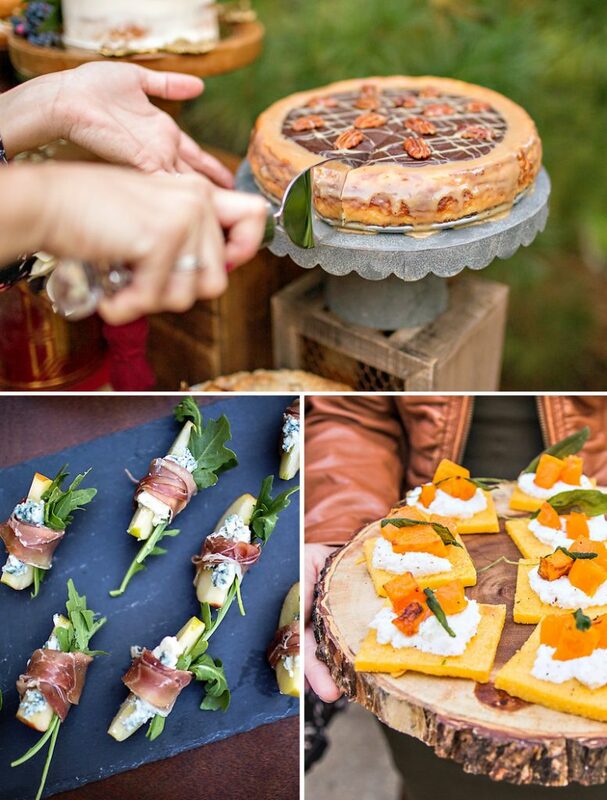 Instead, I created a heavy fall-inspired appetizer menu and asked each guest to bring a pot-luck dish to share. 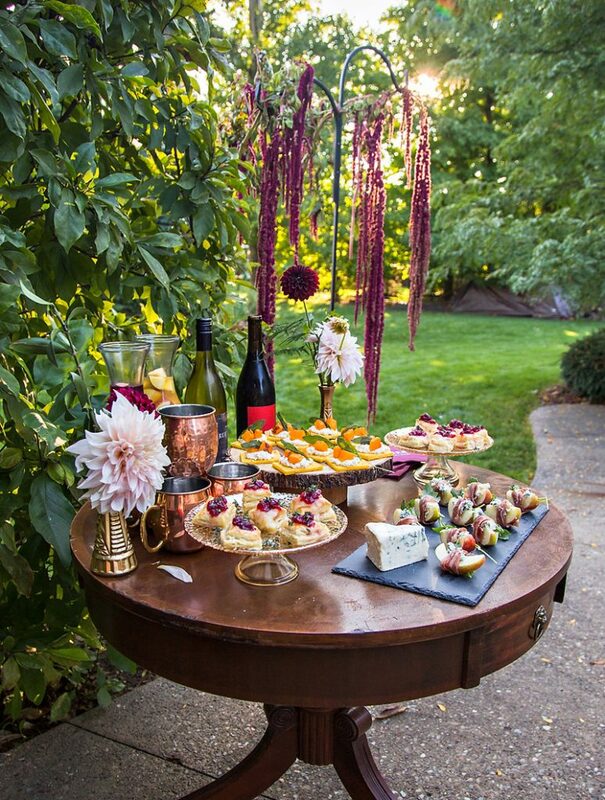 The appetizers included cranberry brie bites, polenta crostini with butternut squash and prosciutto wrapped apples with blue cheese. 6. Let the Desserts Shine. If it were up to me, I’d probably skip the dinner and go straight for desserts! Just kidding. 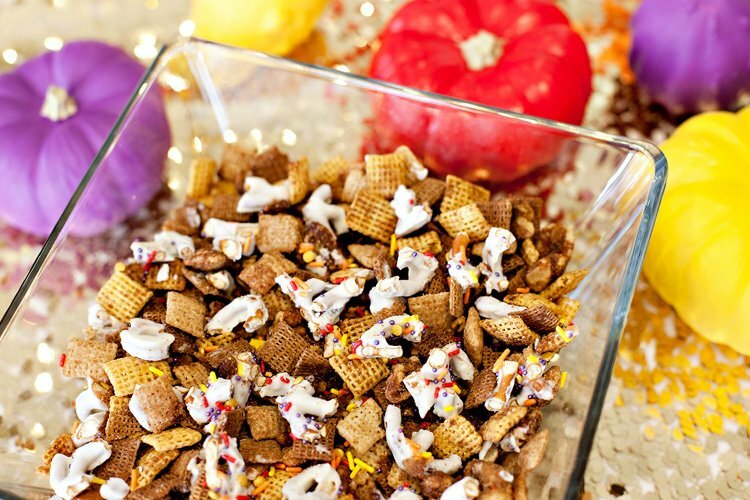 But I do think Friendsgiving is a fun event to serve up an array of sweet treats, such as pumpkin spice cake, gourmet donuts (which are super on trend right now), turtle cheesecake and fresh pies. 7. Leave a Lasting Impression. 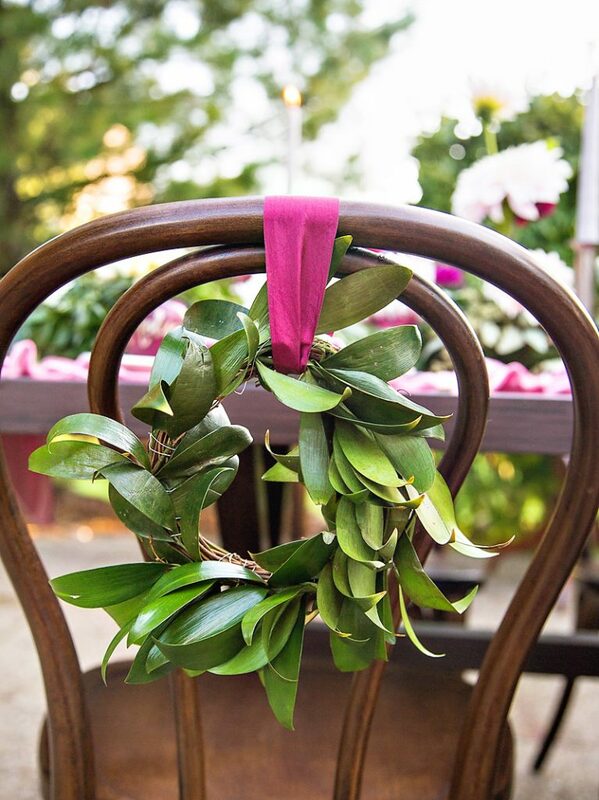 As a parting gift for each guest, I created a small DIY greenery wreath that doubled as decor on the backs of the chairs during the party. My friends also surprised me with an amazing fall-themed gift basket including a bottle of wine, gourmet chocolates and an adorable fall print that I can’t wait to display in my house. Whether you are hosting an event or attending one, party favors and hostess gifts are a great way to leave a lasting impression. I hope you enjoyed reading my tips for a throwing a Friendsgiving dinner party. The party I hosted was such a fun evening spent sharing delicious food, sweet treats and laughter with a great group of ladies. 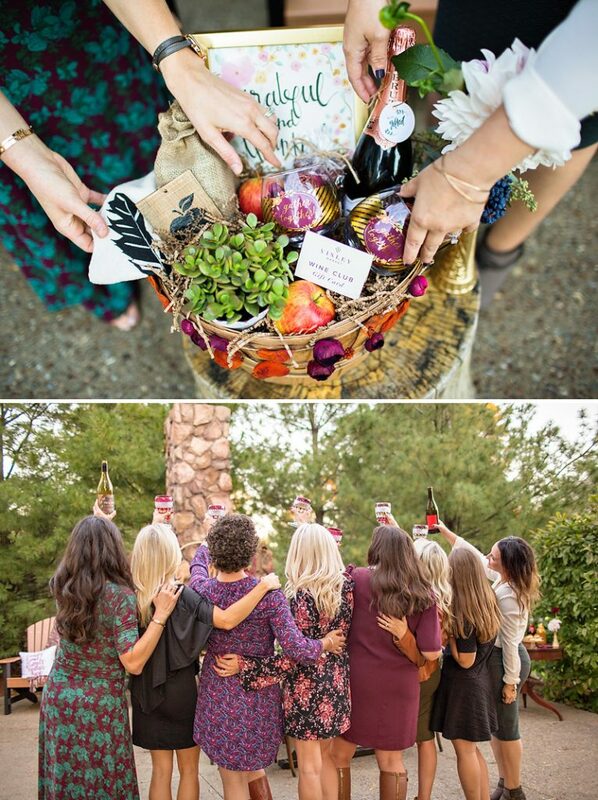 I can’t wait to make this all-girls Friendsgiving an annual tradition each year! 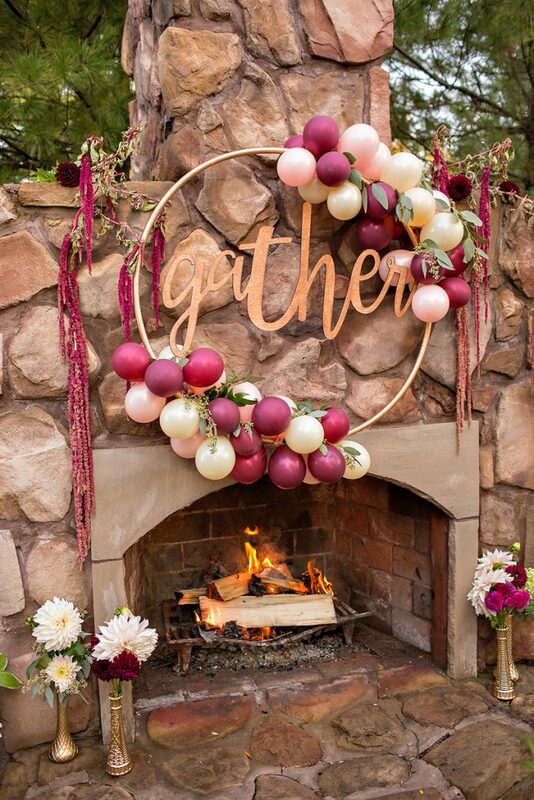 How did you make the “Gather” balloon wreath? Where did you find the large gold hoop? I love all your wonderful ideas. I was wondering where you bought or got the materials to make your metal gather circle wreath. I have a friend who host parties on her outdoor patio for others in the community. It would perfect as a gift for all her kindness.